Google has expanded video ad options and added a new online video campaign creation section in the AdWords UI, allowing advertisers to create video ads for delivery across the Google Display Network (GDN) and the YouTube within a single interface. As YouTube is the second largest search engine in the world, this change brings with it a massive increase in available search inventory for Google AdWords advertisers who are part of the limited beta test. Whilst current YouTube advertisers will see a huge increase in available inventory via the GDN too, they should also enjoy a subtle change to the payment structure for advertising on YouTube search. The new AdWords functionality includes features a blend of targeting options that many online marketers will be familiar with. Interest and category targeting is available, much like bidding on the display network and keyword research tools are available which resemble the original paid search interface (and also YouTube promoted videos keyword tool). Most importantly, along with interest category targeting options, keyword searches on YouTube can be targeted with video ad formats but rather than paying per click, advertisers only pay ‘per-view’; where ‘per-view’ is the full length of the ad. 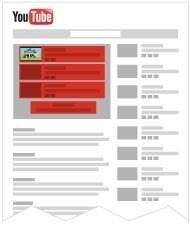 This is a significant change as previously YouTube search ads were charged on a per-click basis. The new AdWords for Online Video interface is part of a larger release that encompassed a revamped set of “TrueView” offerings, Baljeet Singh, a Senior Product Manager for YouTube, told Search Engine Watch. TrueView is the cost-per-view charging model devised from data on YouTube promoted videos, which found that users were willing to watch relevant and engaging ads. Whilst there are a variety of TrueView ad formats, with slightly different functionality, they operate on the same cost-per-view basis which meaning that advertisers only get charged if a user watches the full ad or the first 30 seconds, whichever is the shorter. Advertisers will not be charged for views in which a user chose to skip an ad. The reason that this is a particularly exciting development is that TrueView now functions much like the AdWords quality score across a broad array of ad positions, where the most engaging ads will win. Put another way the ‘relevancy’ auction model in traditional keyword search, based on clickthrough rate, is now a competition for ‘engagement’, in which the video ads which get full plays will secure the best ad positions. What this means for advertisers is that there will be increased competition for shorter and more succint video ads – which is ultimately a win for users. The option to pay according to engagement metrics pertinent to the specific media types mirrors recent changes in the charging model for mobile campaigns in Google AdWords, where “click to call” ads, mean advertisers are charged per call rather than the click. It’s a savvy strategy as, in both cases, the largest marketing budgets cannot be used to flood this motherload of new inventory with poorly targeted and uncompelling ads for the media type. Equally the low cost to enter the market means that advertisers can spend more time perfecting online video creatives. Singh noted that, while Google has already experimented with video ads on the Google Display Network (GDN), “we’re trying to do more of that, increasing the amount of inventory that’s available to advertisers,” and especially more inventory that works on a click-to-play basis. The interface has also been revamped to cut the 30 page campaign creation process to two-step process that cam be completed in a few minutes. Furthermore, it streamlines the process of promoting video content on the Google Display Network (GDN) and YouTube, where previously determined video advertisers had to use two different products to reach the most online video viewers. For paid search advertisers not already using video ads, the YouTube search volume should provide significant incentive to start experimenting with video ads. But for those experienced video advertisers the replacement of pay-per-click ads for TrueView ads on YouTube mean that new efficiencies can be found in budget spending, and the chance to experiment with different video approaches for different ad positions. “We definitely think using sight, sound, and motion to convey the message applies to all kinds of verticals, including retail,” said Singh. Indeed, at SEW we have heard many positive tales of video campaigns to sell airplanes, insurance, jewellery, gizmos and consumer packaged goods. Whilst Google is not the first to do a huge video display ad and content network and YouTube recently lost their crown for being the largest, this shift is likely to be a mixed blessing to other video networks such as Blinkx, Undertone, Tremor Media, Jambo Media and Grab Networks. Whilst it may be a threat to have such a big player stomping on their patch, Google entering the fray will massively expand the market for video advertising. Moreover, their familiar and easy-to-use technology should bring in more advertisers and simultaneously make the market more fluid and efficient. With TrueView pricing across YouTube and the display network, Google are literally discounting campaigns for innovation as far as I can tell. Let’s hope that advertisers realize this and experiment with different video creatives for all the different ad positions. Surely an in-search video ad message is different to an in-slate or in-display ad? They have given any eager video advertisers a lot of room to innovate in front of a huge audience without breaking that bank.